Manhattanism is over. The paradigm that produced the skyscraper; the delirious grid of New York; the extremity of urban density; the congestion that in turn bred a heightened geographic exclusivity, is a dead paradigm. The urbanization of places of finite geography, such as islands, deltas, and archipelagos has established certain social and political hierarchies endemic to a center-periphery relationship. It is this exclusivity of finite geography that pushes out the detritus of urbanization to the periphery claiming the center for the promise of a few. Despite the rapid horizontal growth of cities in recent years, the historic centers have clung to the center periphery relationship established in Manhattanism and refuses to embrace the overwhelming inevitability of the Megalopolis or Inter-regional city. In face of the inevitability of the continuous city, it is time to confront the exclusivity and social division that finite geography has wrought. We must empower a new urban player—not of verticality such as the skyscraper of Manhattanism but of a horizontal mega-formal nature. The bridge is the vessel for this new paradigm. As a piece of the urban equation, the bridge has the ability to undermine the discreteness of natural geography and impose an urban order at the inter-regional scale. The 19th century city was established around the commerce of the port of arrival and thusly was built at the confluence of waterways. Hereby goods would meet piers and then be released into a road network behind. This is the process that sculpted the development of the urban morphology of many American cities and is indicative of the chaotic gridding of lower Manhattan as well as its gridiron north of Houston Street. The densification of the finite geography at the center of the historic city led to the expulsion of larger land-uses and blue-collar industry to its periphery. In turn, bridges were manufactured to facilitate the importation of goods over land and services previously externalized to the hinterlands. With this center-periphery condition came the class division and extreme social separation that is synonymous with the Manhattan of today as well as many other cities in North-American Urbanism. In order to subvert this exclusionary zoning we must envisage a new player capable of recapturing the pieces of urbanism that have been cast-out of paradise. Morphing Manhattanism argues for the use of the bridge as a device to promote a sense of inter-regionalism in lieu of the isolationism resultant from Manhattanism. Formally, the bridge has always been an emblem or an icon of a regionalist project. The sight of the tower of a bridge within the fabric of the city or the view of its incline departing from the ground plane creates a semiotic connection to the greater world beyond the immediacy of the local. The sight of the bridges serves as a reminder that this place is a part of a larger interconnected web of life. The programmed bridge challenges the concept of the world beyond a discrete set of regional urban growth points relationship in light of a more inter-regional continuous city model by establishing shared nodes at the hinge-points of geographic divides. 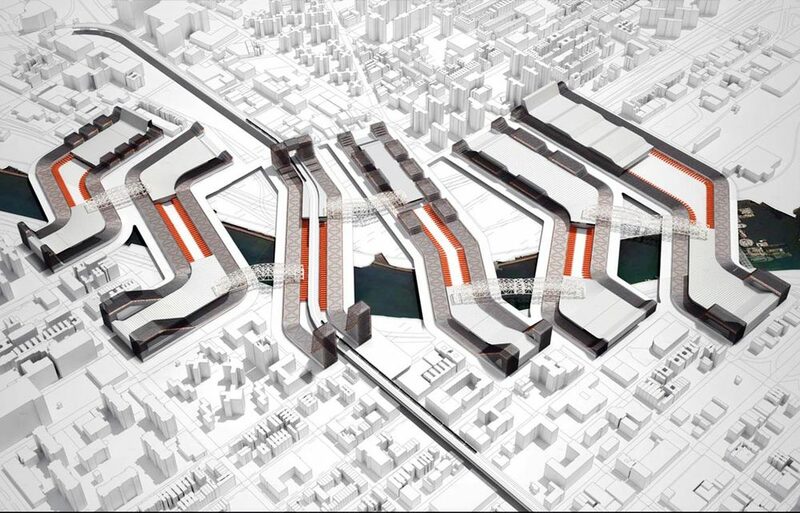 The bridge will be the point of order within the inevitability of the coming wave of the continuous city. The bridge, as a piece of infrastructure is a totality composed of three discrete formal parts; the emergence, the incline and the object. 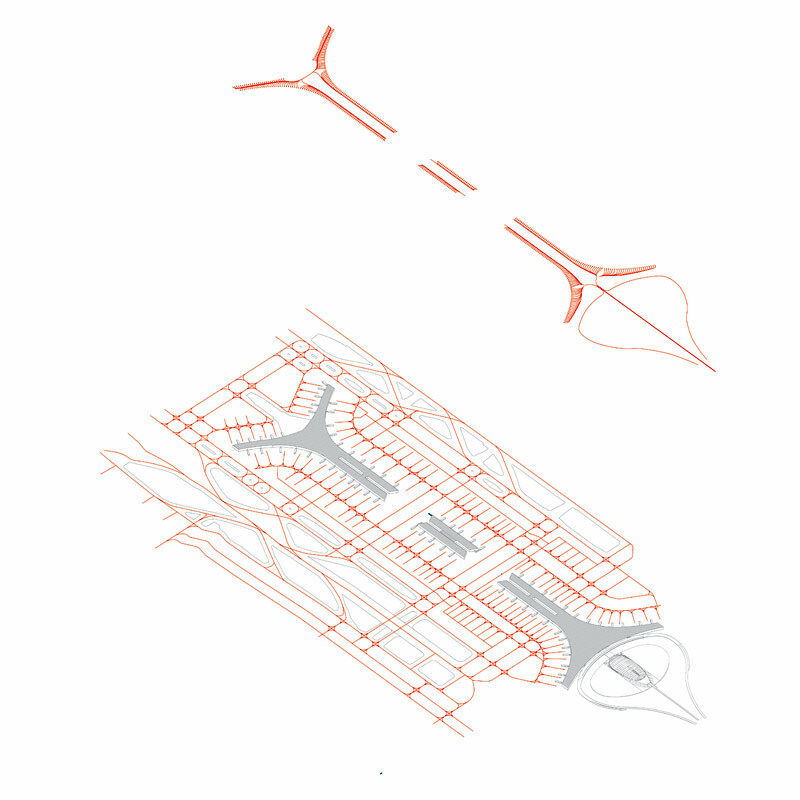 Each of these parts of the bridge perform distinct roles to form our perception of the city-region, and going forward will be programmed to reflect that role. Simultaneously, the three pieces of the bridge function together to create a world within its own right; a world that is both in and out of the city. The emergence is the transformation and integration, a condition during which the bridge is neither a completely constructed geography nor a part of its immediate ground surface context. 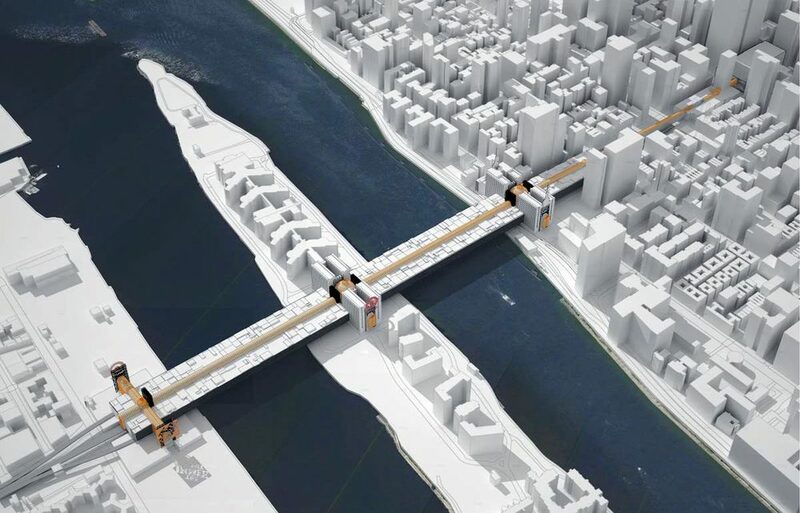 It is at this moment that the bridge is enabled with the ability to invigorate the area around it by catalyzing growth and connections within the existing urban fabric. 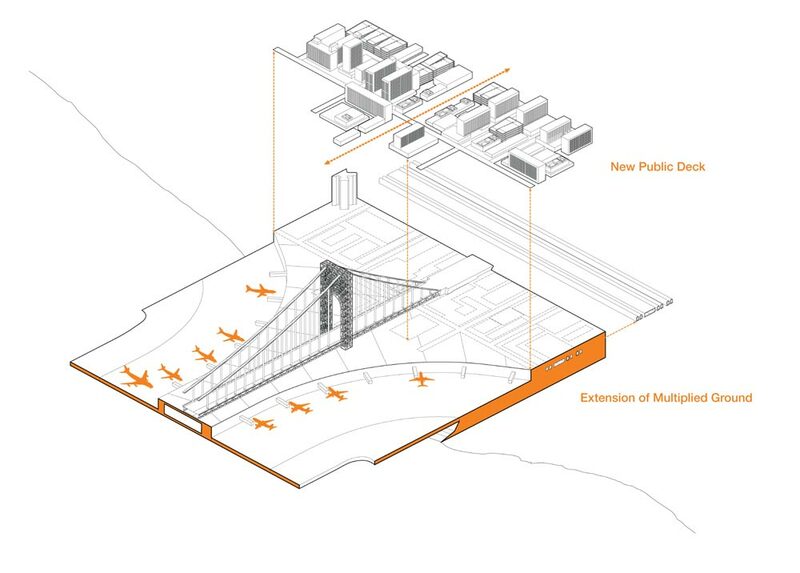 The incline is the point of removal from the city, constructed in an oblique shift of the surface plane that carries users over the land-divide. The incline demarcates the moment of separation from geography and introduces the threshold of another world. Herein, the occupant of the bridge is locked into a journey of vehicular one-way traffic. The cars and pedestrians alike are within the bridge’s structural cage no longer in Manhattan and not yet in Brooklyn but instead outside of the urban world. Outside are the familiar buildings of the geographic context from which the cars just departed; inside the occupant becomes conscious of the tilted datum behind which sits the normative world. The third piece of the bridge is the object, the center of the bridge-world that is completely removed from land by the incline. Several historical bridges have demarcated the object by vertical structural piers built to suspend the vehicular deck with tension cables; historically these piers have been formed as monumental arches signifying the threshold of departure from terra firma to new land. In this next urban paradigm, The Object will be the housing for the cast-away programs and land-uses of forgotten hinterland urbanism. The concourse of the object is the exposition of a new type of urban geography, bringing thousands of users to the nexus and hinge-point of inter-regionalism. Herein, the newly programmed object, gives over to the masses the visual construct of the panorama. This new space for the public, neither in one land-mass or the other, creates a viewing platform to visually compress the disjointed city into a singular image of unified urban geography. These three parts allow the deconstruction of natural geography both literally via its constructed linkage and metaphorically through its method of blurring together two distinct worlds within the panorama of the city. As Manhattanism ends, so too does the need for density via verticality; new archetypes emerge purposed for an inter-regional order formed over the mobility corridor conduits such as the bridges and highways. 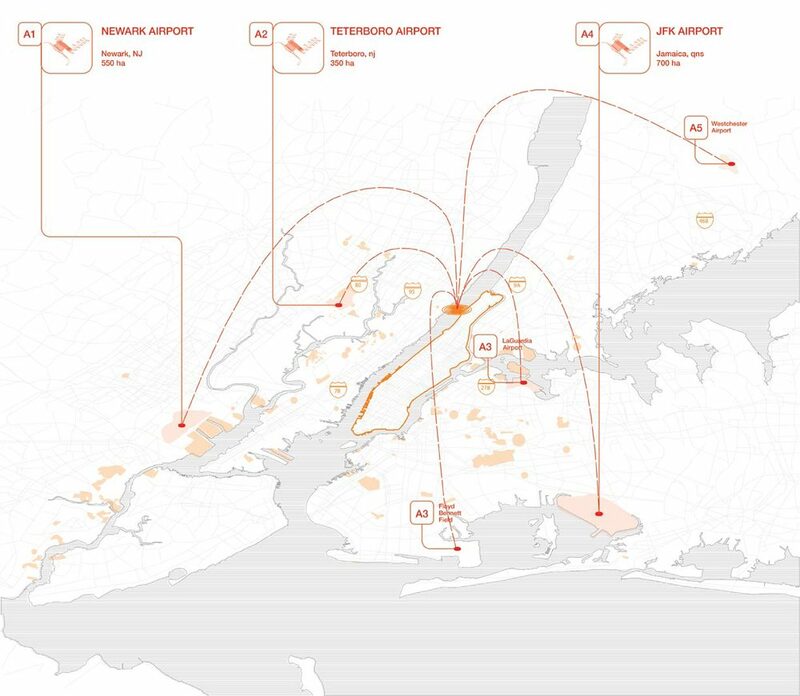 The airport, as a key economic generator is pulled from the hinterlands and hung over the divided geography of the Hudson River. This new placement allows for the integration of a new speed of infrastructure into the underground metropolitan transport via the bluffs of Washington heights. The service industry, of food goods and wholesale markets historically a part of the river-way and later expelled into smaller ex-urban economies, is pulled back and placed at the nexus of the flatland Harlem Riverbed as a Market Bridge. This commerce center enlivens the corridor in between formerly separate municipalities reusing the existing river-way rail transport lines once laid for this exact intention. This logistic landscape is compressed with user functions and parkland of markets creating new public space between formerly segregated urban boroughs. The megamall, previously a gargantuan box in suburbia now emerges from the commercial downtown and bridges the water into its surrounding boroughs. The Olympic parks and stadium spaces that had been pushed out of the city are now housed in the river between geographic neighbors serving as event destinations to join neighbors. The example of these new bridges create a new sense of urban geography, blurring the boundaries of the city by creating shared nexus points within a larger urban continuum. The bridge is no longer a zoom-scape between two discrete places. It is now an urban event space; a place that reminds us of natural geography by lifting us to engage in the perception of the city as a whole, while simultaneously denying the shortcomings of ground condition in its ability to house larger programs and operate on the edges of the city. The bridge now sits poised to be key player uniting the region together, programmatically, physically and infrastructurally informing a new geography. This new definition of the bridge reduces Manhattan to a piece of a greater Megalopolis; to a part of a dispersed world; to the anthill artifact of a now interconnected nest. The island is broken; its shores have been breached.